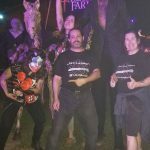 Deceased Farm is a Haunted Attraction located in Lexington, SC. Team Jefferson Starship reviewed this Haunted Attraction on September 29, 2018. In the fields west of Columbia, SC, you can find Deceased Farm (DF). This site transforms from a working farm that is throughout the year into a Halloween spectacle in late September. There are a handful of different, day-time holiday events on the farm for younger visitors, but at night, the Deceased Farm opens up and all manner of clowns, monsters, and psychos come out to play. Spread over two acres of corn field and a smattering of shacks, graveyards, houses, and junkyards, the Deceased Farm is filled with scares and frightening images. The Farm is one long walk through all of this, filled with twists and turns designed to disorient you so that you never quite know where the next scare is coming from. If you’re used to the scattered smaller haunts in South Carolina and ready to step out into something bigger and more intense, the Deceased Farm is your next destination with something to scare nearly every individual in the group you bring with you. There are a lot of actors fulfilling a variety of roles across the Farm. Many of these actors work well together, building up tension as you move between them, some of them appearing and reappearing in various places. We especially found the various actors haunting the cornfields to be wonderful. They did an amazing job of showcasing what Deceased Farm is capable of – from a variety of costumes, interaction, and scares. Too, the various clowns scattered through the 3-D opening section of the haunt were very interactive with us, the props around them, and the house itself. There was even a helpful disembodied voice that we heard more than once. There were other highlights among the cast as well – in particular a specific playful bunny like you’ve never seen before and a fellow in the cornfield whose fingers we were worried about. Of course, we would be remiss if we didn’t mention the antics of Scooter the Clown and Stretch who provided interaction in the front enclosure. These two provided not only some photo opportunities but also some scares and comedic relief for those about to enter or in the process of leaving. The costumes at the Farm are well-done and there is nothing out of place. Some costumes are easily visible, like Scooter and Stretch in the enclosure where things are well lit and close up. There were a few masks here that are unlike others you will see anywhere else locally, including some that incorporate additional features. Though there was a maddened housewife, turned butcher who was perhaps a bit too clean. The costumes were believable enough to make you feel like you were trapped in an unfolding horror movie. Makeup and masks were well done – especially in the 3-D house. Birds may become a new fear of yours after you leave! There was more than one haunter in mask that was mistaken for an inanimate prop by some of our team. Those masks were very well done and the actor’s sudden movement added to the shock and scares. The Deceased Farm is easy to find out on Olde Farm Road – no, really! That’s the street. There are multiple attractions on the property, so be careful to look for the specific parking area for the Deceased Farm and not the other attractions. In past years, there have occasionally been individuals in the driveway/parking lot directing traffic, but we arrived both early in the season and early in the night before things reached the volume to need one. If you’re visiting on a Saturday night during October, take the parking lot area slow and easy. There are tons of visitors to this popular haunt and the parking lot sometimes strains to contain them all. The staff overall are friendly and delightful. In the interior enclosure, most of them stick to the well-lit areas, so if you need help, just head towards the lights. 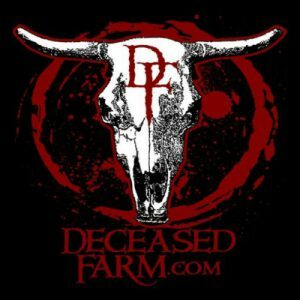 The website for Deceased Farm is comprehensive, focused on the haunt side of things with links pointing to other activities at the location. The Farm is a cash only attraction! Though there is an ATM on site, it is best to bring cash when you come – not only for your tickets but for various, additional attractions. From the parking lot, one might be unsure of what is to come – high wooden walls obscure the view of the horrors within and music mostly covers the sounds of screams and chainsaws. However, once you step inside the ticketing trailer, the decor starts to ramp up. 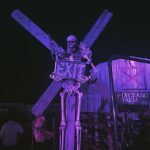 Moving into the enclosure, you can find wandering haunters (the aforementioned Scooter the Clown and Stretch) as well as skeletal horses and a small field of zombies – just a little taste of what lurks behind the barn door entrance of the Deceased Farm. There are a few additional attractions in the Enclosure – the field of zombies is overlooked by a stand of paintball guns, there’s a well-lit beer garden featuring brews with holiday-themed names (21 and older only, ID required), and there are some brief, 5-minute escape rooms. All of these things are additional charges not included in your base ticket price. There is also a live DJ playing music that echoes over the enclosure adding to a feeling of excitement and fun. Though there are occasions where things seem to be loud just for the sake of being loud, there are some great examples of special effects to be found at the Farm. From the detail of their graveyard to their scattered cornfield huts and houses, many of the sets are very well done. The internal scenes and props are not neglected either – from an Ed Gein ceiling to a giant (and suddenly appearing) Pumpkinhead to a particularly realistic and bloated dead body (we’re mostly sure it was just a prop), there is a lot of attention to detail put into the surroundings at the Farm. Unlike some other haunts, here you will find that the decor is not just to each side of you, but occasionally underfoot or looming over your heads. So much so that you will find yourself ducking either in reflex or just simply to move through the scene. The lighting beyond the cornfield even plays in. While you’re wandering through the corn, listening to things rustle nearby, the lights and fog beyond the cornfield do an amazing job of turning the sky into an atmospheric backdrop that only adds to the surreality of the experience. The thumping casket and a ceiling zombie in one of the crypts were great fun. Too, we loved the experience of ducking into a hole in the wall, following after some shadowy figure before us – that helped set a scene hearkening back to countless horror movies. The Deceased Farm doesn’t have a single theme throughout – your visit will cover everything from 3-D clowns to cannibals in the corn to the undead in a graveyard to strange cultists of different types. Each of these different areas is self-contained – you won’t find a clown wandering the corn (well, maybe Scooter, but she shows up everywhere) – but there isn’t much to tie the different areas together as one. Deceased Farm is a great haunt that provides a lot of fun for its guests. They do a decent job of providing scares for the whole group, but whomever you put in front is definitely going to get the brunt of the attention in many places. Scares come from a variety of angles – both low and high in terms of props, and of course actors popping out and appearing from a variety of places. One aspect of scares that Deceased Farm excels at are distractions. This is one place where the actors in the different scenes and rooms do a great job. One of them will draw your attention which serves ample opportunity for another to appear where you least expect them, ready to deliver a scare on top of the suspense that their partner or prop is building. You can’t let your guard down for a moment during your visit without opening yourself up for an unexpected line of scary attack. We walked the entirety of the haunt in thirty minutes which is not bad for a $20 ticket. (Note: some days they have $16 tickets if you want to increase the value you’re getting.) It should be noted that Deceased Farm is a very popular haunt – well-deservedly so. But that also means that it draws some very large crowds. If you want to lessen your wait on a busy night, check out their fast pass option or if you anticipate spending a lot of time here, consider their VIP ticket option which includes some of the additional cost attractions with your ticket price. Information on all of these ticketing options can be found on their website. Internally, Deceased Farm makes a good use of its space. There are small transition areas between some scenes and the trail through the corn works well to move you from place to place without letting up on tension. The enclosure where you wait to enter the main haunt could be better. After you’ve joked with (or been made to scream by) Scooter and Stretch, there’s not much else that doesn’t hit your wallet. The inclusion of those other attractions – zombie shooting, escape rooms, beer, concessions – is great, but once you’ve staked out a place in line you’ve got little else than music and the conversations with your friends to bide the time until you reach the door.